The bravest pets on the high seas! Okay, we know about those famous voyagers, who sailed the seas to discover new lands. We know about the boats that took people fleeing wartime to their new homes post World War II, and we know the continuing importance of boats for trade and commerce. But, did you know that alongside our human heroes were often furry first mates. Welcome aboard our blog about the brave marine pets of seafaring history. Global studies of ancient feline DNA discovered that cats were domesticated in Egypt and the Near East around 15,000 years ago. So, lets acknowledge cats for (probably) being the first pets to get their sea legs. Around 3 thousand years later, Romans brought chickens onto military ships, as they thought the illustrious birds could predict the result of battles. How? Well, if the chickens ate, the battle would be won. If they didn’t, you were doomed. Publius Claudius Pulcher, a Roman General, conducted the chicken ritual prior to the Battle of Drepana in 249BC (against the Carthaginans). The chickens did not deliver the verdict he wanted so he threw them into the ocean. (Not. Cool.) Needless to say, he lost the battle sorely. The moral? Listen to chickens, or at least, don’t be mean to them. Even though animals have belonged in sea faring history since its beginnings, we don’t hear so much about them in the records. That is until a few maritime museums in Australia and the UK started to host exhibits about pets on at sea. Patricia Sullivan, founder of the Museum of Maritime Pets, noticed this and started to research the topic further. “At first I thought this was going to be my retirement project, but almost overnight people started finding us and sending us photos, journal entries, or other written accounts on maritime pets,” she said to Atlas Obscura. The online museum runs thanks to 4 volunteers, and has been operating since 2006. Sullivan says that cats, dogs and fortune telling chickens are included in the history, as well as fishing birds (cormorants) and even reindeer and bears (in Northern countries). Animals have played a particularly important role during times of war. Sullivan told Atlas Obscura about a cat called Simon, who served aboard the British Royal Navy sloop HMS Amethyst. The vessel was attacked by the People’s Liberation Army on the Yangtze River during the 1949 Civil War, and as a result was trapped for 3 whole months. Simon won the Dickin Medal – a prestigious award given by the People’s Dispensary for Sick Animals – for warding off rat infestations, boosting the morale of crew and surviving injury. Sullivan said many dogs had received awards, but Simon was the first cat. 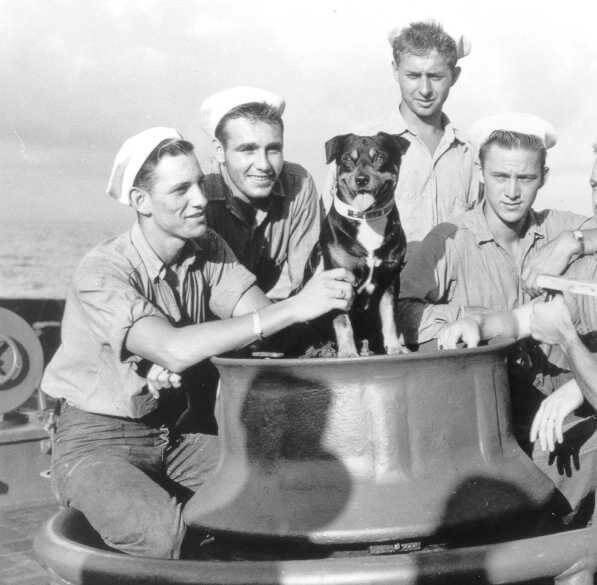 Another famous war animal was Sinbad, a mongrel who served on the USCG Campbell, which defended US convoys in World War II. After a U boat attacked the 327-foot vessel in 1943, the Campbell nearly went under. The press heard about Sinbad when reporting on the near miss, and he became famous. Editor of Coast Guard magazine Eddie Lloyd said Sinbad was a ‘true sailor’, who ran amok in different ports and cause chaos in foreign lands. “Perhaps that’s why Coast Guardsman love Sinbad,” said Lloyd. While we can’t cover your four-legged (or 2 legged!) friend, we can cover your boat. Talk to us for more on our comprehensive maritime insurance, which will give you peace of mind while you’re enjoying time on the water. Oh, and if you’d like to read more about animal legends at sea, head to this epic blog we sourced facts from!